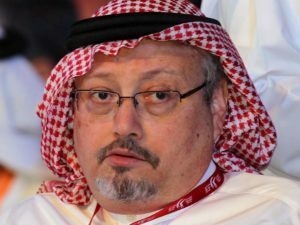 The Saudi journalist Jamal Khashoggi was confirmed dead on Friday evening after a two-week disappearance that sparked an international diplomatic crisis. Khashoggi went missing on October 2, 2018 after entering the Saudi embassy consulate in Istanbul. He was there to pick up documents required to marry his Turkish fiancee, PhD student Hatice Cengiz. She immediately reported him missing and Turkey authorities began an investigation in earnest despite Saudi opposition. In the days immediately following Khashoggi’s death, it was revealed that a team of 15 Saudi security operatives, some specialized in body disposal, had entered Istanbul the morning of Khashoggi’s disappearance and left later that same day. Later the Turkish officials claimed to have audio recording of Khashoggi’s torture, in which his fingers were severed, and his death and dismemberment. Despite mounting evidence to the contrary, the Saudi Arabian government insisted that Khashoggi had left the consulate and alternatively suggested he had been the victim of a rogue killing. They changed their tune in the middle of the night on Friday, conceding that Khashoggi had been killed after a fight in the consulate led to his strangulation. Then, officials say, his body was given to a “local collaborator”, thus explaining why the Saudi regime does not know where the body currently is. This version of events has been rejected and ridiculed by the Turkish government as well as the international community. The CEOs of companies like Ford, J.P. Morgan, and Uber have announced they will not attend a business conference held in the Saudi capital of Riyadh later this year. American lawmakers from both parties have demanded more information and pleaded with President Trump to take action against the Saudi regime. Trump himself has largely supported Saudi Arabia in the wake of the gruesome killing, initially saying on Twitter that Crown Prince Mohammad “totally denied any knowledge of what took place in their Turkish consulate” in a conversation with him. He has alternatively said that if there was evidence to the contrary, some sort of action would be necessary, but has been vague as to what that action would be. Following Saudi Arabia’s admission that Khashoggi is dead, Trump called the Saudi’s statement and several arrests “good first steps.” Later the administration announced the Treasury Secretary, Steven Mnuchin, would travel to Saudi Arabia in order to repair the economic ties between the two countries. International backlash is expected to continue in the coming weeks as information continues to emerge and national governments continue to respond to Khashoggi’s slaying.